The tendency, when a team loses the game in the manner which Arsenal did, is to dissect the winning goal in such detail that nothing else prior to that really mattered. And in a sense in the Champions League, that’s right. For large periods of the 2-1 defeat to Borussia Dortmund, Arsenal dominated but were dealt a sucker punch when Dortmund broke quickly and scored when Robert Lewandowski arrived unmarked at the back-post. There were a series of flashpoints leading up to the goal, however, which were particularly influential; why Bacary Sagna had committed that far up the pitch; why Tomas Rosicky and Mesut Ozil only cantered back; and why Kieran Gibbs decided to get tight to the player in possession instead of holding his position as Arsenal were outnumbered. In the end, Arsenal might want to focus on the wider issues that contributed to the defeat, namely how tired they looked, especially as they played very well on the whole. But in the Champions League, the margins are thin, as Borussia Dortmund themselves found out two years ago when they crashed out of the group stages, that it’s imperative to take advantage of the good spells you have, and to stay firm when you’re on the back foot. At the final whistle, Arsene Wenger was particularly hurt, saying that for the two goals (Aaron Ramsey was dispossessed for the first) Arsenal were “naïve” (in contrast, Jurgen Klopp praised the “maturity” of his team). However, the problem of naivety has been levelled at The Gunners for a while, and indeed, except for the run in 2006 when they reached the final, Arsenal haven’t altered their approach much for the European stage and they’ve been punished. Could defeat be a turning point? To be fair, Wenger’s side have shown more awareness recently and they started the game in cautious fashion – although perhaps overly so. They were unable to enforce the same intensity on the game as they did in the early minutes when they defeated Napoli 2-0. Instead, they dropped back, looked to get into shape and build a platform from there. In short, it was the perfect defensive strategy for Europe. 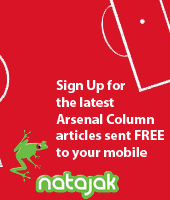 But on the flip-side, Arsenal were guilty of being too passive when they allowed Dortmund to open the scoring. Mikel Arteta intercepted the pass, played it to Ramsey who, shorn of options, and the best option really was to punt the ball away as Arsenal were so deep, was dispossessed. Again, you can level at Arsenal that they were a bit naïve because Dortmund come to life when they force opponents back. When Ramsey received the ball, Klopp pressed the button from the stand to activate Dortmund’s gegenpressing and in an instant; he was surrounded by three yellow shirts. Marco Reus stole the ball away, Lewandowski passed it to Henrikh Mkhtarian, and the Armenian finished. Managing Moments: The minutes where the match was won. Courtesy of UEFA.com. Click to enlarge. It took a while for Arsenal to get back into the game, and when they did, they moved the ball magnificently. Initially, they found it hard as Dortmund got tight to the midfield and denied them space. Passes went astray: Jack Wilshere had a pass success rate of 50% from 30 passes. But then again, it was players like Wilshere who helped Arsenal negate the early press, by gliding past with skill. It was ironic that Arsenal conceded the opener when Ramsey was dispossessed because Arsenal’s close-control was outstanding and indeed, it was Ramsey’s sidestep away from Sven Bender which opened the space for Bacary Sagna, and his cross fortunately found it’s way for Olivier Giroud to score. Arsenal were stronger in the second-half and as they sensed they had the ascendancy, tried to increase the tempo. Rosicky, on a yellow card, dropped back in midfield to play a more conservative role, helping Arsenal distribute the ball better (as in the first-half, he was often penalised for over-zealous tracking back) while Ramsey pushed higher to press Dortmund. But, they only created one real chance when Santi Cazorla hit the crossbar after a flowing move and were later punished by Lewandowski for over-committing. (The importance of Theo Walcott is obvious when Arsenal have days like this; lots of good approach play but need something else, someone to make runs behind, to break from the neat and intricate). Indeed, the second-half raises an interesting question, one which Wenger might have to find a solution to if his side are to succeed in Europe: if creating chances is the hardest thing to do in football, perhaps instead of pushing too much (too early) when in control, maybe it’s better to assert the dominance (and then push towards the end)? Arsenal’s style has always been a bit gung-ho, although the signs are they are beginning to add greater game intelligence to their game and learning how to “manage moments”. 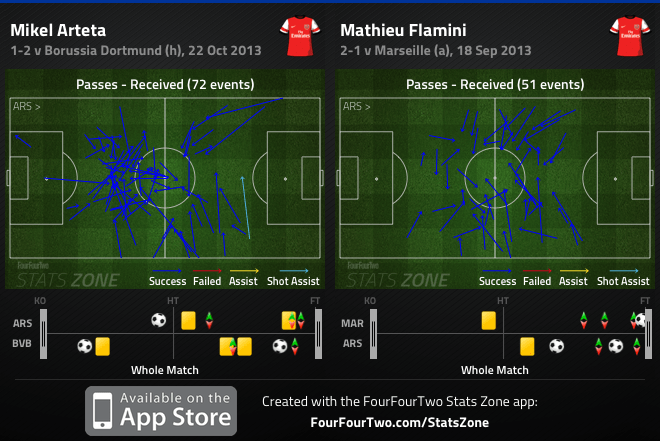 Had Mathieu Flamini not been concussed, he surely would have started, given Arsenal the protection they sorely needed. Mikel Arteta did a fantastic job – making 11 tackles – but there’s no doubt Arsenal missed Flamini’s guided hustle in front of the back four. Finally, there was another question raised about Arteta’s passing; that it was too ponderous, too safe. That’s a little unfair but certainly; he could do a little more to make Arsenal’s passing game quicker. That was mostly down to his positioning as he’s always looking to move up the pitch to give space to the centre-backs in the build up, when perhaps he should be doing more to create better passing lanes for himself. What that entails is moving wider to pick up the ball or occasionally drop in between the centre-backs. Flamini’s passing is often under-appreciated but one thing he does well is to always move into the channels to create better angles to receive the pass. The double-pivot is probably Wenger’s preferred option in Europe – and that means Aaron Ramsey will have to miss out playing in his favoured position. However, it might be the right choice to allow Arsenal to prodress in Europe.